A pensive Taeko on the night train taking her to the country. This is one of the Studio Ghibli anime that despite huge popularity in Japan seems to have been sidelined in UK and US distribution. I wasn’t aware of the film when it appeared in Film 4’s Ghibli season earlier this year. Most of the films in the season were dubbed but this one, playing very late at night, was subtitled. I’m assuming Disney never bothered to find an English language cast for it. Why has it been overlooked? The most obvious answer is that it doesn’t fit the Western expectations for an anime. Even though it features a small girl for much of the time this is in fact a ‘romantic drama’ for older audiences. It was the highest grossing Japanese film of 1991. Based on a manga by Okamoto Hotaru and Tone Yuko, Only Yesterday was written and directed by Takahata Isao. Co-founder of Studio Ghibli with Miyazaki Hayao, Takahata is probably best known in the West for Grave of the Fireflies (Japan 1988), the heart-wrenching tale of two children escaping the fire-bombing of Kobe in 1945. 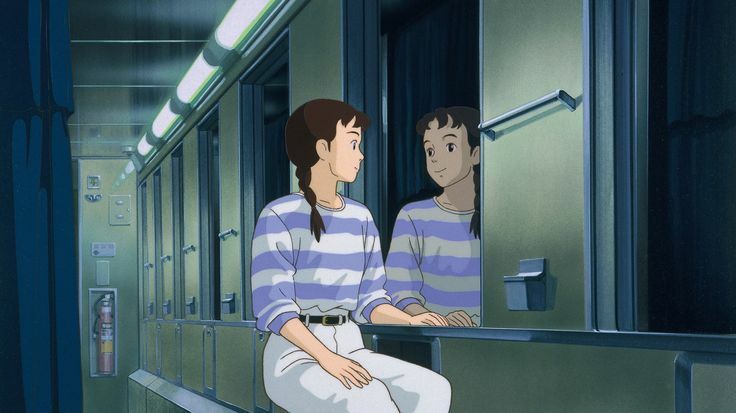 Only Yesterday is not dramatic in the same way but it is equally moving. Taeko is a young single woman working in a Tokyo office in 1982. When the other workers plan exotic summer holidays she decides to visit the countryside and stay with distant relatives. She’s been before and this time she wants to pick safflowers – traditionally used for making dyes and cosmetics. Taeko has already heard the comments that at age 27 she should be married and this trip seems to trigger very strong memories of how she felt as a 10 year-old being taken to a spa town on holiday. Takahata then constructs the whole narrative as a series of flashbacks to 1966 interspersed with ‘life on the farm’ where Taeko’s ‘time off’ is spent with Toshio, a young man who tried working in Tokyo but decided to return to the land as an organic farmer. In 1966 a pineapple is still an exotic fruit and the family doesn’t know how to serve it. There are a couple of informative and very interesting reviews of Only Yesterday on the Studio Ghibli wiki at nausicaa.net. One notes that the Japanese title translates as ‘Memories of Falling Teardrops’ and that this is much more evocative of the mood and tone of the film. I agree and, although I’m wary of referencing Ozu at every turn, I also have to agree that the film has the same careful investigation of family relationships found in Ozu’s films. 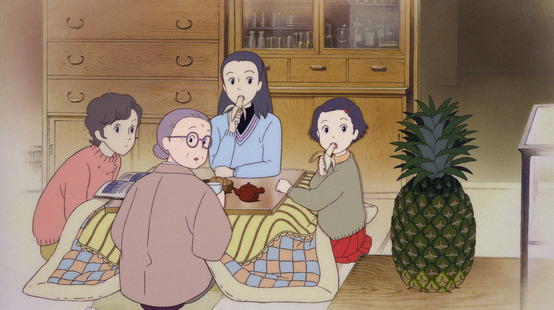 Takahata even presents the film’s credits against the kind of hessian background used by Shochiku and other studios for their 1950s and 60s dramas. There is the same nostalgia for Japan in the 1950s that appears in Miyazaki’s My Neighbour Totoro. Taeko is the youngest of three girls and experiences a combination of love, bullying and high expectation from her stern father, no nonsense mother and grandmother and older siblings obsessed with the Beatles and the ‘new Japan’. Takahata shows in great detail how Taeko is affected by seemingly trivial incidents and how they build up into almost traumatic episodes – a first crush, embarrassment over discussion of menstruation, an inability to understand division of fractions, a dream about becoming an actor. Some of these are bad memories but they all need to be worked over by the adult Taeko. The field of safflowers and the distant hills. In aesthetic terms this is a ravishing film with two distinct animation styles. 1966 is detailed in simply drawn and coloured scenes whereas the landscapes of rural Japan in 1982 are exquisitely beautiful. There is a focus on music, including several East European songs that Toshio tells Takeo that he likes because they are ‘peasant songs’. 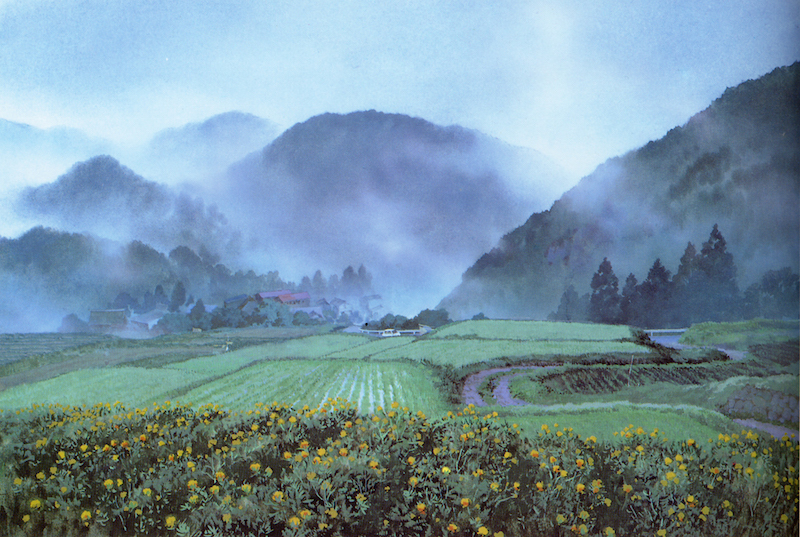 Like Miyazaki, Takahata seems to have been a big promoter of ecological concerns and there are detailed conversations about organic farming and the relationship between humans and the rural landscape. The film is primarily about Takeo’s choices and after spending a summer holiday in which Toshio has helped her think through all her childhood concerns it seems fairly obvious that he might be ‘the one’. But Taeko has always been stubborn and self-willed. Will she finally go with what seems a sensible option? This is a lovely film that ought to make any audience feel better about the world. There is a UK Region 2 DVD and a US Blu-ray, I think – but no English dub (hooray!). Many reviewers have said this is their favourite Ghibli DVD. I think I might still go for My Neighbour Totoro but this is seriously wonderful. Please seek it out – you won’t regret it. Manga and anime are discussed in The Global Film Book in Chapter 5. This entry was posted in Japanese Cinema and tagged anime, Studio Ghibli, Takahata Isao. Bookmark the permalink.